*All includes Public Emails (Weekly Newsletter, Chamber Events & Luncheons, Women in Business Events, Business After Hours, Ribbon Cutting) sent to all Chamber Members. Does not include individual employee emails or internal committee emails. If email content focuses on a direct competitor of the advertiser, the ad will not be shown. Your company’s banner ads will be shown for 10 seconds, each rotation. Your company will provide the banner ads to the Davis Chamber. If your company requires professional help to design these banner ads, please contact the Davis Chamber of Commerce and we will direct you to Chamber members who can help you. 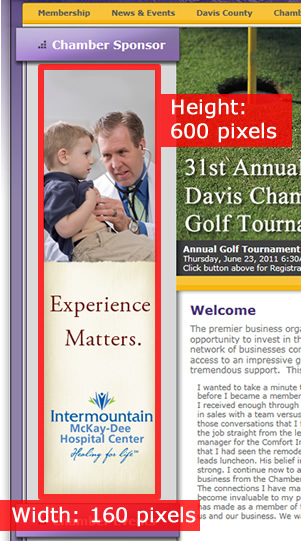 Have your banner ad be shown on emails sent by the Davis Chamber. Your company’s banner ad will be at the top of all Chamber emails. The ad size is 665px wide by 100px tall; file type is .png, .jpg, or .gif.